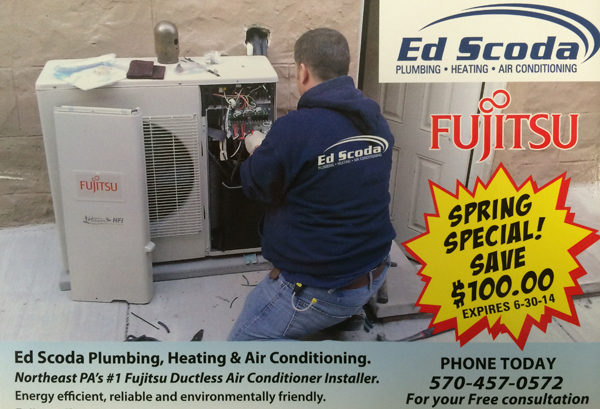 Welcome to Ed Scoda Plumbing, Heating and Air Conditioning conviently located in Old Forge, PA. We've been servicing both businesses and residents in Northeastern Pennsylvania since 1977. Because we're family owned and operated, when you hire Ed Scoda Plumbing, Heating and Air Conditioning you receive the best in customer care and satisfaction. We have knowledgeable, well-trained, radio dispatched staff who are 100% committed to each and every one of our customers, providing peace-of-mind and professional service you should expect from a company that comes into your home. When it comes to plumbing, heating and air conditioning for residential or commerical - Ed Scoda are the guys that you can count on. For prompt service, contact us today. Check out our current money saving promotions available today.